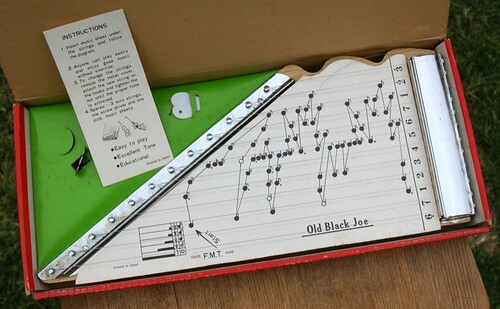 1) a vintage "zippy zither", in perfect condition, all lovely metal and wood, complete with pic, tuning key and over 20 song sheets to perfect your playing. 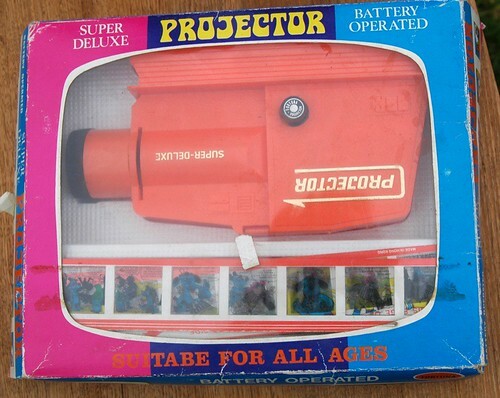 2) a late 60s battery operated projector with a ton of really bizarre little cartoons to project. also works with regular slides, which is great because my step father took hundreds of slides of my sister and i growing up. 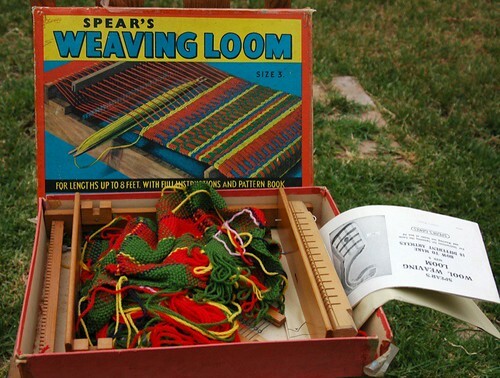 3) late 60s or early 70s children's weaving loom. i was sooooo excited about this one and can't wait to give it a try in autumn, maybe a woven scarf? 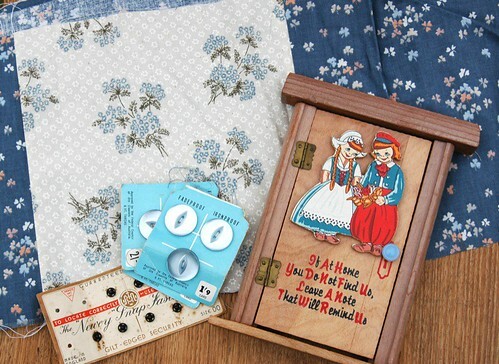 it came complete with instruction booklet and patterns. 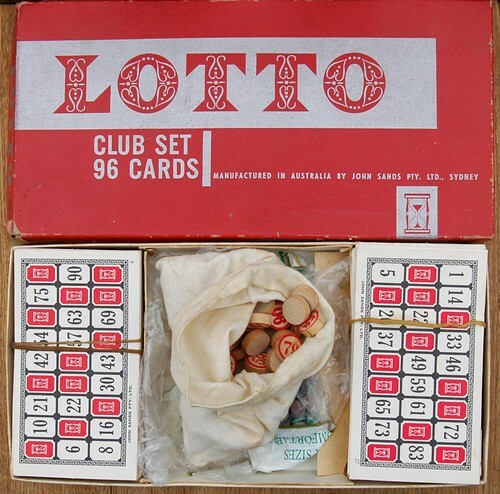 5) 50s lotto game with all pieces intact, including great little wooden game pieces and very cool looking play cards. 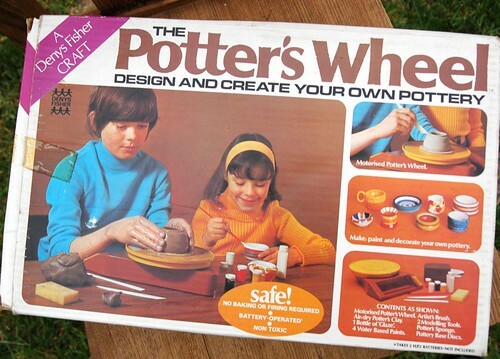 6)70s/80s battery operated potter's wheel - i've seriously wanted one of these for since i was about 10. just need to get some air dry clay to work with and i'm off! 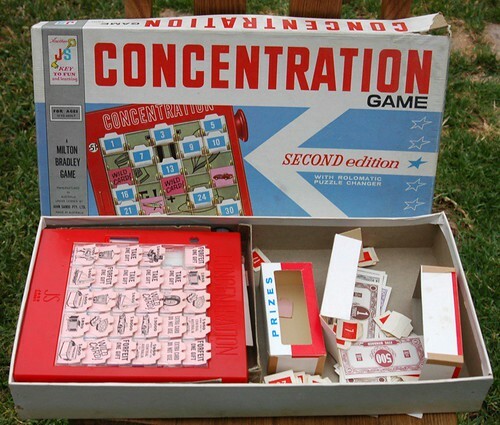 7) 50s/60s concetration game. i don't know if all the bits are in this one but i love the look of the pink paper game pieces so i snapped it up anyway. so i'm already pretty thrilled at this point and i continue on my way to my intended excursion for the day - the reverse art truck in ringwood. it's pretty much on the opposite side of the city from me so i don't get there often but it's an amazing resource for fabric/wood/leather samples, scraps and offcuts plus a huge range of other random supplies to be used in art and craft projects. you can join up as a member or fill a large green garbage bag for $25, which is what i do. i scored some great pieces this time, large and small, as well as some leather cord to use in my wip holiday ornaments. because it's such a long drive, i'd scoped out a couple of op shops in the area and, while i didn't find heaps, the pieces i did find were more than worth the 80km round trip on their own. 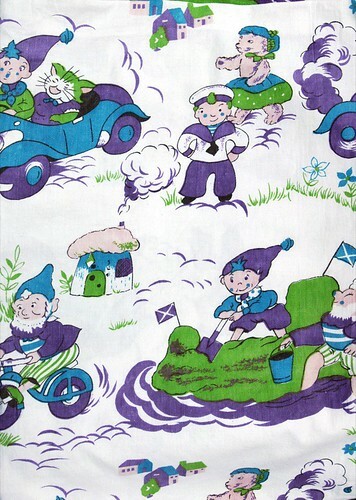 and then at the st vinnies just outside ringwood i found this amazing vintage child's sheet in perfect condition. 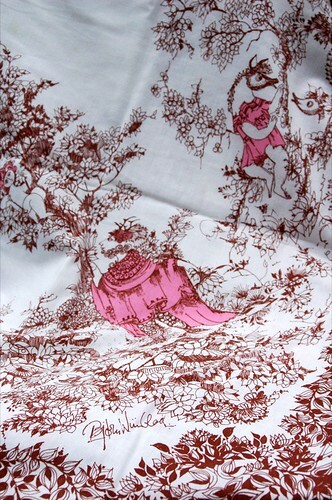 i don't know if it was ever even used, it's still nice and thick cotton with vibrant colours and no rips or tears. i drove the long way home absolutely beaming, with my car full of goodies and my tummy rumbling - it was the best thrifting day i've had in a loooong time, possibly ever. and just to assure you that luck isn't always with me, this past saturday i hauled myself out of bed at 8am to drive down to hoppers crossing only to be sorely disappointed with a church garage sale that looked more like cheezy flea market. absolutely nothing was found there or at the two op shops i stopped at on the way home. thrifting luck, it all balances out. Wow - what a spectacular day out! Some days you can just do no wrong hey? Thanks for the tip about the reverse art truck - I had not heard of it, but it sounds wonderful. Must make the effort to visit it. 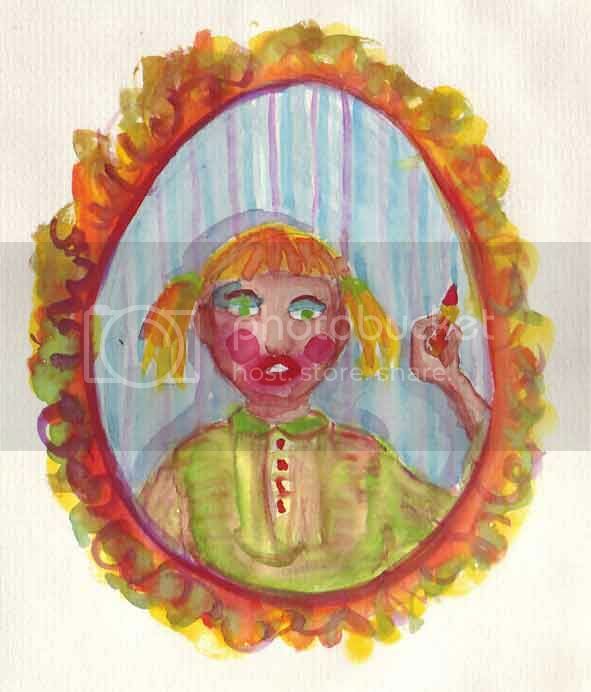 Happy crafting - looking forward to seeing what you come up with. The motherload! that tablecloth is just ridiculously amazing. i am so jealous! 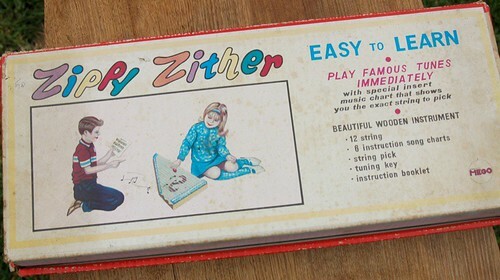 that zither is fantastic, and i think i'll need to buy whatever you make out of that tablecloth. what a great day you had!! it was freezing and snowy here and i only left the house to walk the dog. you win! Such good op shopping - brilliant, brilliant, brilliant haul. I'm glad that reverse art was good to you. I went there a little while ago & came out empty handed. You are right of course it all balances out & next time it'll be gold. There's nothing like a bit of thrifting therapy. So glad you had a good haul. You win the All-Time, Hall of Fame Academy Award of Op Shopping. I'd gush over all the things I want for myself, but I'd be banging on forever. You certainly hit the motherload with that haul, Leslie! Oh my god, you really scored big time! I will have to check out the Reverse art truck. It looks like fun, but I am sure I will come home with a whole lot of stuff that I don't need. Oh wow, what amazing finds! WOW! THE most amazing finds I've seen!! The tablecloth is incredible, not to mention the potter's wheel and projector! I'm scrolling and going Ooh, Ohhhh, OHHH, OHHHHHH, OHHHHHHHHH. 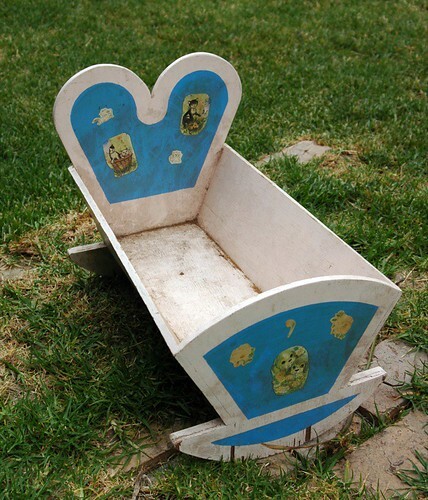 Do you know I paid $37 for a vintage wooden cradle on ebay a few weeks ago to restore for my girl, and it's not as nice as that one. The thrifting fairy was surely with you that day. 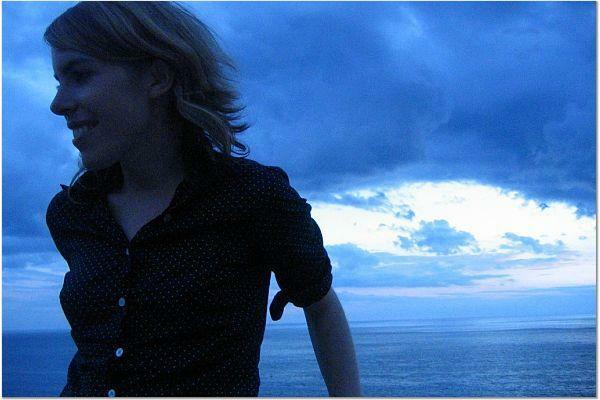 I'm extremely envious (in a nice way. WOW. Lots of cool thrifting Leslie. I have tagged you. No pressure - only when you have time. Super queen of of the garge sales. That is a great haul -well done. Love the sheet and what a great find all those games were. I thought of you on the way back from voting the other week stopped at a garage sale and they had 60's striped cups and saucers I could picture them in your shop. I didn't buy them as I personally have more than enough cups to be going on with.